Last night, I had the pleasure of dinning with a couple of old friends, who appreciate food as much as I do, so I let Paige drive our dinner choice. Her pick? The Fat Radish, and it was not disappointing. The restaurant is in the lower east side, but you would never find it just strolling around. It resides on a street with no other open restaurants or shops. It is for the outsider, a bit uncomfortable to walk down a dark street that is totally closed up, but Paige and Christopher have been living in this neighborhood for several years, and they move comfortably and confidently down the block to the restaurant. I love it from the entrance, which is dimly lit and yet not at all dark feeling because of the light white washed feel and the rustic decor that bespeaks its farm to table approach to food and wine. We were welcomed by the comforting and inviting smell of roasted summer vegetables, as if ratatouille was the latest fragrance from Pottery Barn Home. We start at the bar. The wines by the glass are interesting, and this makes me happy as I order a glass of Gavi di Gavi, a crisp minerally white from the Piedmont. This is a popular choice these days, I often have customers request it, so I am always glad to try a new one that may find its way onto my shelves. It is surprising to me that they actually have two Gavi's on what is a short though good list by the glass. I take this as a good sign that they are thoughtful about their choices because it is a great choice for food. It is a white that is interesting despite its seemingly simple appearance. On first tasting it, it seems relatively easy, nice but not noteworthy, but as it comes up to temperature a bit, it releases some interesting floral aromatics and shows the complexity of both a toasted nutty note on the finish along with a briny mineral flavor that makes my mouth water and my stomach call out for food. We ordered a couple starters, Dukkah on naan, which I had never even heard of before. I quickly grab my iphone and look it up. Thanks to technology, I learned that dukka is a Buddhist term loosely translated into "life is suffering," but it is tied to understanding the four noble truths and understanding that all things are temporary. Most translators resist translating the word because of the impossibility of doing justice in English, and this linguistic difficulty is telling when I try to describe to you the dish, which I think shares the name. I should say that dukkah, spelled with an h at the end is an Egyptian spice blend of seeds, nuts, and spices that are ground into a rough powder....nothing at all to do with the Buddhist term, but We really tried to create some interesting connections....maybe it was the Gavi, but that was the thread of my thoughts. 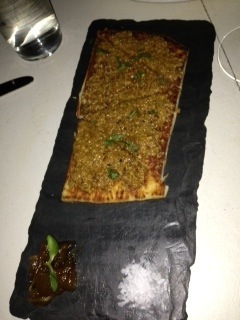 At any rate, the dukkah on naan was innovative and flavorful, and it was surprising. The best plate of the night was the zucchini and tomato starter, simple but perfectly cooked and so satisfying. That is the thing about summer vegetables, sourced locally, they are so fresh that they taste alive. All of the main courses were delicious, too, each one with a variety of vegetables, greens, and fresh herbs. The meals are simple, but they shine because the ingredients are of the very best quality.